Ashrams.in was designed to expand knowledge, information, and guidance regarding ashrams, yoga, and India. Traditionally, an ashram is a religious hermitage. In Sanskrit it means "toil, penance, or austerity." Broadly speaking the term ashram often denotes a locus of Indian cultural activity such as yoga, music study or religious instructions.The dwelling place of a Guru or saint; a monastic retreat site where seekers engage in spiritual practices. It is a spiritiual learning center. It is a sanctuary where all things external are directed towards empowering and deepening the experience of inner exploration and transformation. 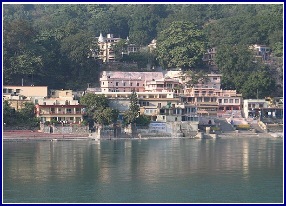 India is known for its Ashrams and spiritual centers. An ashram would typically, but not always, be located far from human habitation admist refreshing natural surroundings conducive to spiritual instruction and meditation. The residents of an ashram regularly perform spiritual and physical exercises such as Yoga. Many ashrams also serve as Gurukuls or residential schools for children. Ashram's have common features. For instance, the place of worship is always in a special room and there are a number of other rooms set-aside for special purposes. There is a hall where the devotees congregate for a meal, the community kitchen where devotees help to prepare food. Most Ashram's are open to all who wish to enter, anyone who goes to the Ashram is welcome to stay as long as they wish and are welcome regardless of race, gender, caste or creed. However certain rules of conduct are expected. Before entering the worship room everyone is expected to remove their shoes as a sign of respect but also for general cleanliness. However, devotees may not enter the Ashram if they are carrying alcohol, drugs, or meat. Everyone sits on the floor to show that everyone is equal in the eyes of God, regardless of whether they come from a rich or poor background. However, it is usually found that men and women sit separately. The women tend to sit on the left side of the room whilst the men sit on the right.